Portrait of a young woman, Betty, in a sweater at an open field, Heart Mountain, Wyoming, ca. 1944-1945. 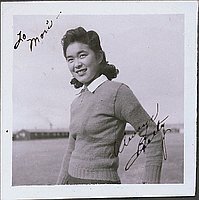 Dressed in a long sleeved sweater with a white color and a cross on a chain around her neck, Betty is turned slightly to the left with proper left arm slightly pulled back from body. She has curly shoulder length hair and smiles to left of viewer. She is visible from hips up. Barracks in the background. Written in black ink on image: To / Mori-- / Always / Betty.